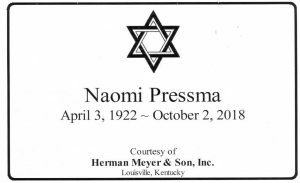 Naomi Pressma, 96 – Herman Meyer and Son, Inc. Passed away at the age of 96 at her home in Louisville on October 2, 2018. Her life is an extraordinary example of dedication to her family, friends and community. Naomi was born April 3, 1922 in Louisville to Carl and Esther Schneider. She was preceded in death by her husband, Boris, her son, Stuart and her brother, Arnold Schneider. She is survived by her sister, Marianne Morguelan, and her sister-in-law, Roz Schneider, her son, Conrad (C.J. ), and her daughter-in-law, Marcelle Gianelloni, her daughter, Diane Gordon, and son-in-law Bernard Gordon, her daughter-in-law, Kathy Broude; her grandchildren, Michelle Pressma, Elise Pressma, Ross Gordon, Terry Gordon, Chase Gordon, Reed Montgomery, and Kyle Pressma, as well as ten great-grandchildren, and many nieces and nephews. She is also survived by her friend and caregiver, Brigette Duncan, and her adopted daughter, Marilyn Sommer. Naomi was a forward thinker and leader. At age 52, Naomi returned to school and majored in social work at Spalding University, and was recognized for her efforts with the Social Worker of the Year award. She then received a degree in Social Work at the Kent School at the University of Louisville. She served as a counselor and provided services to the elderly for Jewish Family and Vocational Service and also was a counselor at Regional Youth Services and an intake worker for the Baptist East Drug Program. It was at this time that she became interested in art and spent many years painting. Throughout her life she dedicated her time to her community. 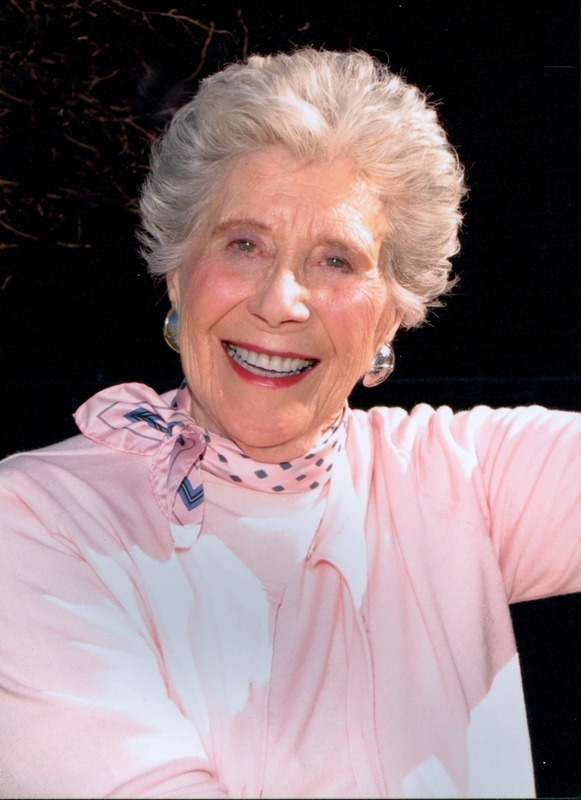 She served as chair of the Jewish Federation’s Women’s Division of the United Jewish Campaign from 1963-1973 and was the first woman to become general chair of the 1974 campaign. She founded the Louisville Diabetic Society (now the American Diabetes Association, Kentucky Affiliate). In 1976 she was presented the B’nai B’rith Person of the Year Award. Her volunteer activities also included service on the Board and/or as an officer for the JHB/USO, the Adath Jeshurun Sisterhood, the Red Cross, the Kentucky Civil Liberties Union, the American Jewish Joint Distribution Committee, the Hebrew Immigrant Aid Society, the Jewish Home for Convalescent Children, Bridgehaven, Home of the Innocents, the Jewish Community Federation, the Council to Prevent Teenage Suicide, the Kentucky Board of Parents Anonymous, the National Conference of Christian and Jews, the Health and Welfare Board of the Community Chest, National Council of Jewish Women, the Kentucky School for the Blind and Byck School. In 1996 she was chosen as one of the six Women of Distinction by the Center for Women and Families. She commented when she received this honor, “My goal has always been to respond to other persons’ needs and to give empathy, understanding and warmth to those individuals.” Her life reflects this. A memorial celebration service will be held at The Temple, 5101 US Hwy 42, on Friday, October 5th at 11:00 a.m., followed by burial at Adath Jeshurun Cemetery. Visitation will begin at 10:00 a.m. at The Temple. The family would like to thank Dr. Jane Cornett and Hosparus for their guidance through Naomi’s last journey and to give much gratitude to her many caregivers who demonstrated kindness and respect for her over the years. Expressions of sympathy may be made to The Temple, Hosparus, the Stuart Pressma Youth Leadership Fund Jewish Federation, the Naomi and Boris Pressma Jewish Community Center Beautification Fund or the Jewish Community Center Building Fund.